For Links to other Topics, News, Comment etc. Contact Form where you can send us Queries, Reports, Corrections, etc. ‘Beau ’ …our hard-working little Mascot! 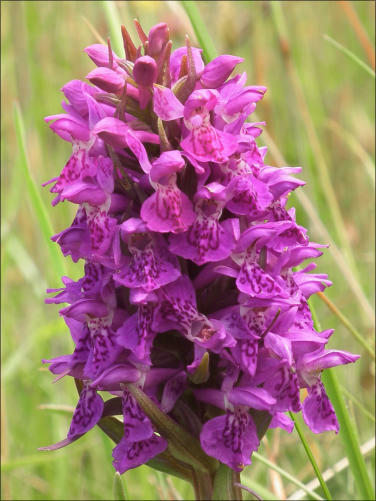 This is one of four Marsh Orchids described as ‘Early’. It flowers from early May to the end of June. 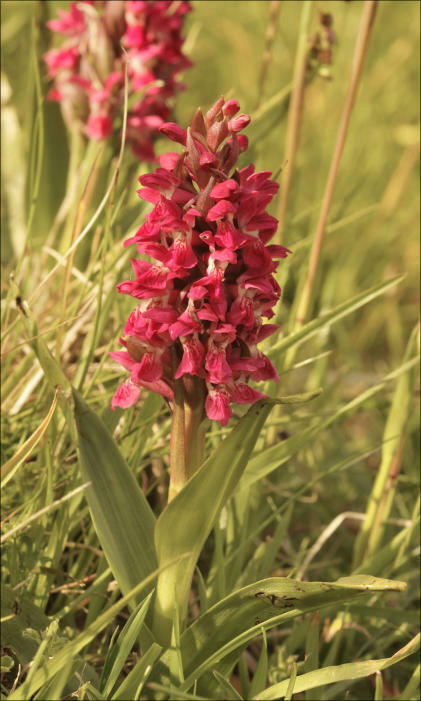 Our collections shows this species in many different habitats around Ireland and in many stages of flowering. 1. Slender plant with narrow leaves but can grow fairly tall. 2. Leaves usually unspotted, long and lying close to the stem. 3. Flowers long , narrow, waisted with a ridged labellum and lateral Sepals vertical. 4. Bracts, no longer than the flower, start greenish and then darken to light brown. 5. 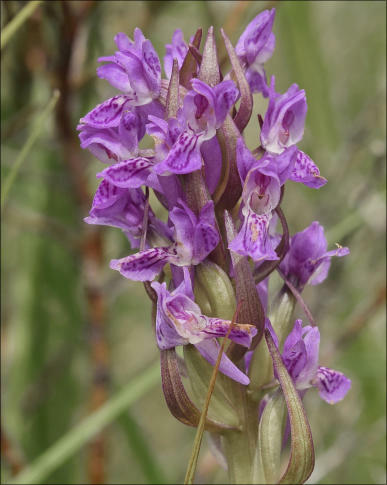 Labellum has a prominent pointed tip which curls back as the flower matures 6. Often pale pink but can be light purple or red or rosy pink… or white! D. pulchella ’pulchella’, coming from Latin, means ‘beautiful little (feminine) thing. 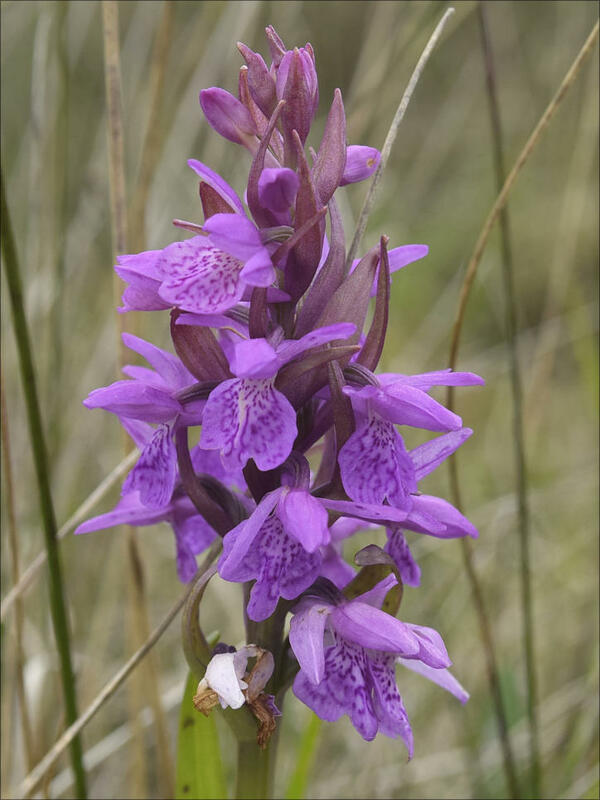 Maybe the species/subspecies name refers to a consistent tasteful colour and a somewhat reduced number of flowers in a spike leading it to have more perfect flowers? 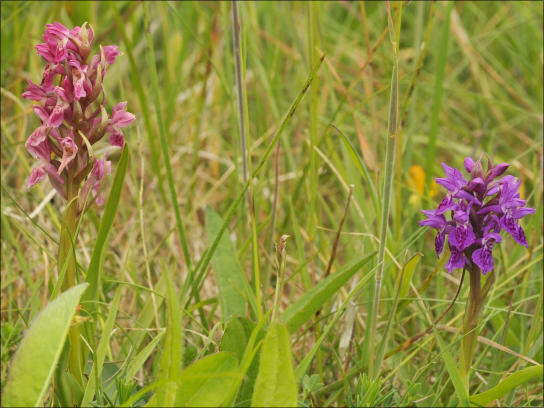 These Early Marsh Orchids can take a hold on the observer. Some are easy to confidently identify, more consistent and more reliable in colour. This is true of the group of images we reproduce for D. pulchella. 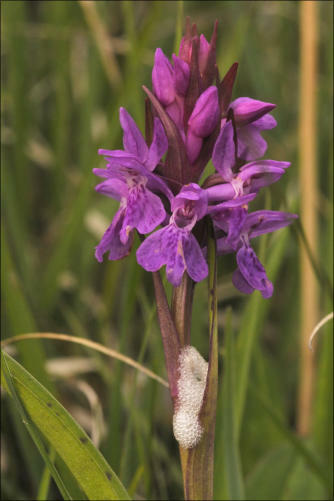 It is another of the early Marsh Orchids and flowers at the same time as the species above. Again our photographs are from diverse times and places being photographed as we came across them. Truth be told, at the early stages, we weren’t sure of what we were photographing. It has been a learning curve bringing this collection together and an even greater learning curve trying to find the right pigeon holes for all of them! This has been a considerable study ranging over 14 years and many parts of Ireland. 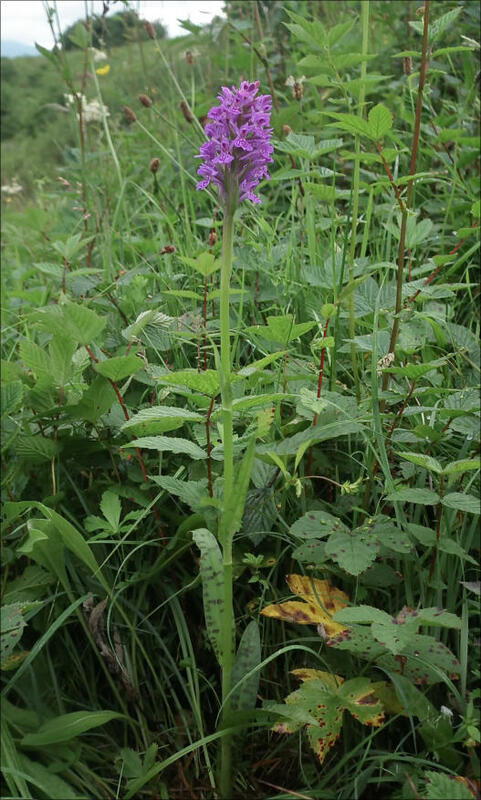 Our initial love affair with Orchids started with the rare Spiranthes romanzoffiana growing around Lough Allen in Co. Leitrim. Thankfully that species was easy to identify. 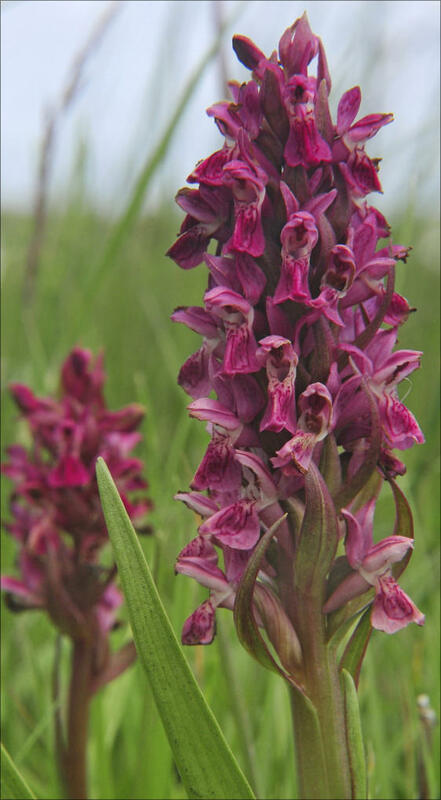 In pursuing that species we did tend to over look mere ‘Dactylorhizids’ of which Marsh Orchids are a major group. However, ‘beautiful and uncertain’ plants always deserved a photograph and we have brought those photographs to bear in helping us to begin to understand this puzzling taxon. 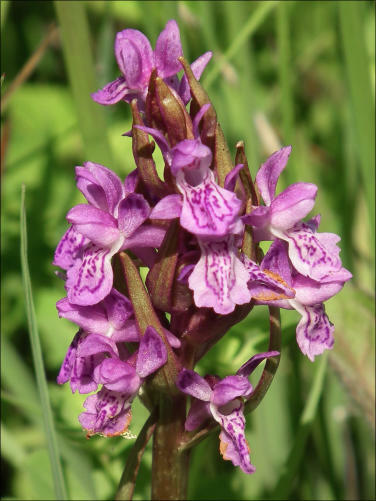 Apart from the variety of species there are many variations and anomalies in the community of Marsh Orchids. Learned Botanists are for ever reviewing and sub-categorising these changing identifications. So forgive us if we have an out-of-date name or taxonomic classification. We are learning! All plants are grouped here binominally (i.e genus and species names) for simplicity sake but also reflecting specific characteristics and other opinion outside these Islands. These photographs have been taken over 11 years with 5 different cameras and numerous weather variations. All this affects colour as does the colour rendering on our monitors — and on your monitor! A very simple movement of the Red / Purple spectrum (as caused by sunshine) can totally change the shade of the plant being observed in the wild. We can correct photographic errors; the human eye and memory seem to provide a very accurate idea of the colour observed but the human brain is much more astute at adapting to what we expect to see. Changes in reflected colour is less noticeable to the eye than it is to the camera. We try to keep track of white balance but in showery Summer weather the conditions can quickly change from bright sunshine to overcast to dark (needing flash). Auto white balance does not seem to be the answer to this and we rely on recollection and post-processing in presenting pictures as accurately as possible. flowers at the same time as the species above. D. coccinea can be recognised fairly accurately from the following features. 1. A sturdy short plant with broad overlapping leaves. 2. Leaves are strongly keeled, unspotted, and curved in towards the flowers. Some leaves being as long as the plant. 3. 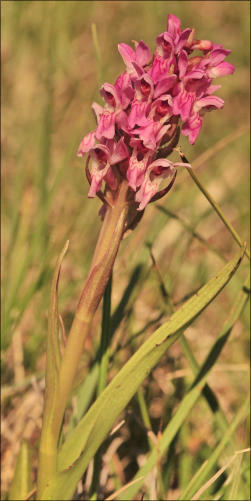 Upper stem and bracts are brownish red. If the plants look green-stemmed there may be a leaf tightly wound at the base of the flower. 4. The bracts are delicate at first often projecting laterally before turning upwards and getting buried in the flowerhead. 5. 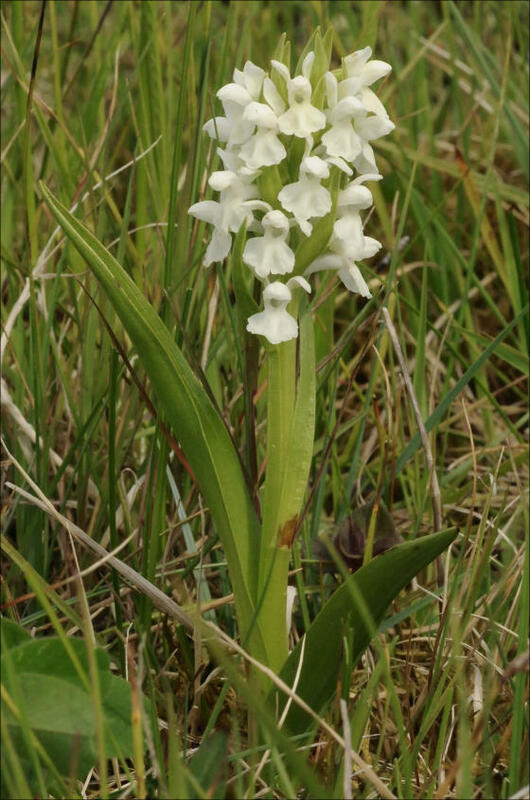 The labellum is unlobed and has a small central pointed projection which is folded downwards in mature flowers. 6. Characteristically, this plant has a very stubby slighly curved (more so on top than bottom) spur which narrows to a curved blunt point. (RIGHT) 7. 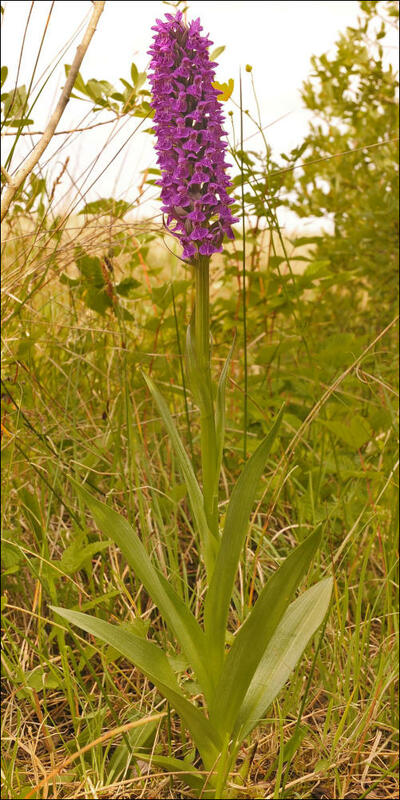 The pure Dactylorhiza coccinea is a squat plant of sandy grasslands. It does hybridise with both pulchella and incarnata and some of these will be represented here. D. cruenta Latin: ‘blood red’. Central European mature specimens can have dark red/brown leaves — like dried blood! 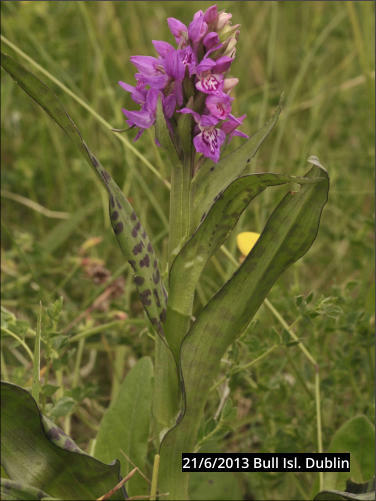 There is a dispute over the occurrence of this Marsh Orchid in Ireland . It used to be classified as a sub-species of D. incarnata. However, we have some photographs that very much match images of this species in international literature. 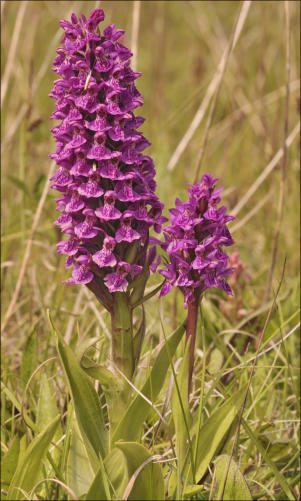 It is commonly known as ‘flecked’ Marsh Orchid. 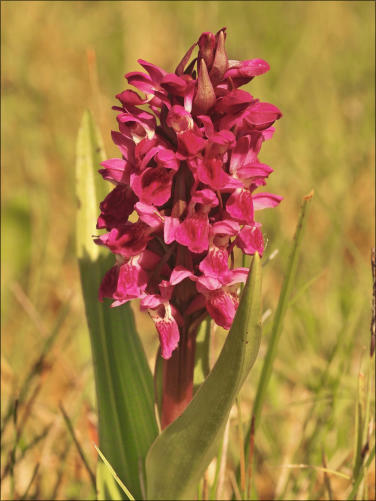 We hope the photographs (below) that we have recovered from our archive are, indeed, the Kerry Orchid which has recently returned to its proper fold and now bears this name due to the work of the National Botanic Gardens. 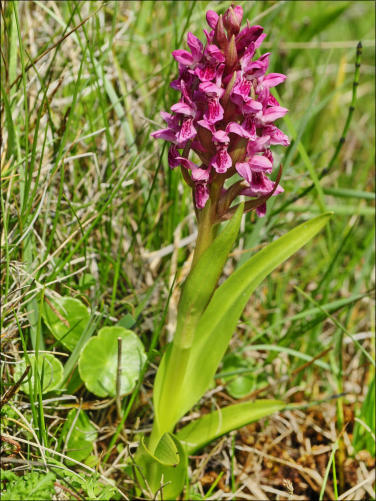 Following some technical research into this species some of the taxonomical issues and historical observations have been resolved and these plants are now regarded as endemic to Ireland and reputed to only occur in Ireland and are a species in their own right… D. kerrryensis. 1. Tall upright plants. 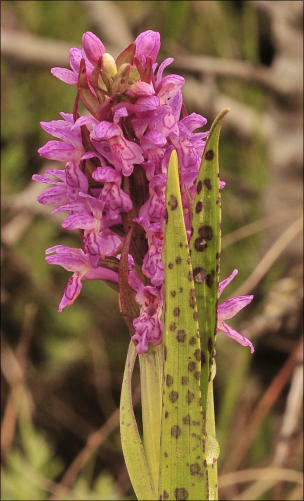 Early flowering typifies this species but specimens shown are from June. 2. Strong sturdy stems with only 4 or 5 wide sheathed leaves at a good angle from stem. 3. Stem and leaves quite noticeably ridged. 4. 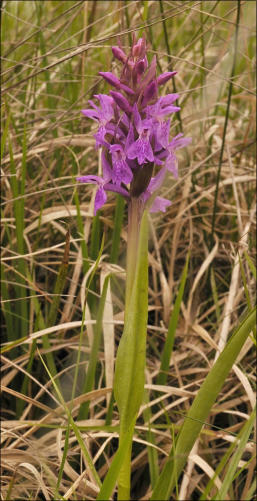 Found in a small cluster on sloping wet meadows near Lough Allen. Only specimens found. 5. Abundant lilac to dark rose/red flowers with white upper labellum (in our limited experience). 6. Clearly shaped labellum with 3 similar promontories facing down and left and right. Spotting on centre lobe. 7. 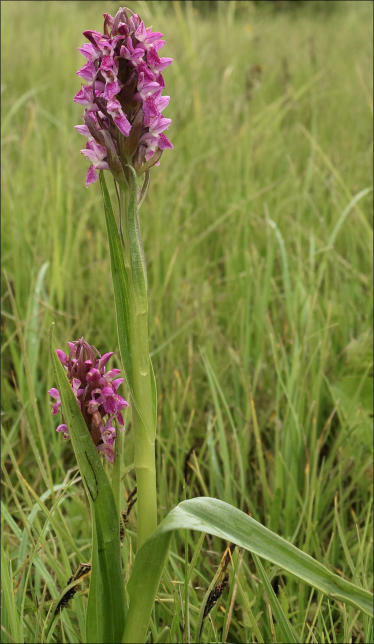 Spur longer, straighter and less curved than other Early Marsh Orchids. 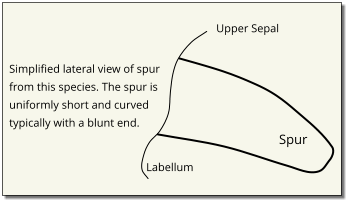 Sepals horizontal and strongly curved. 8. Leaves and bracts and ovary green at first. 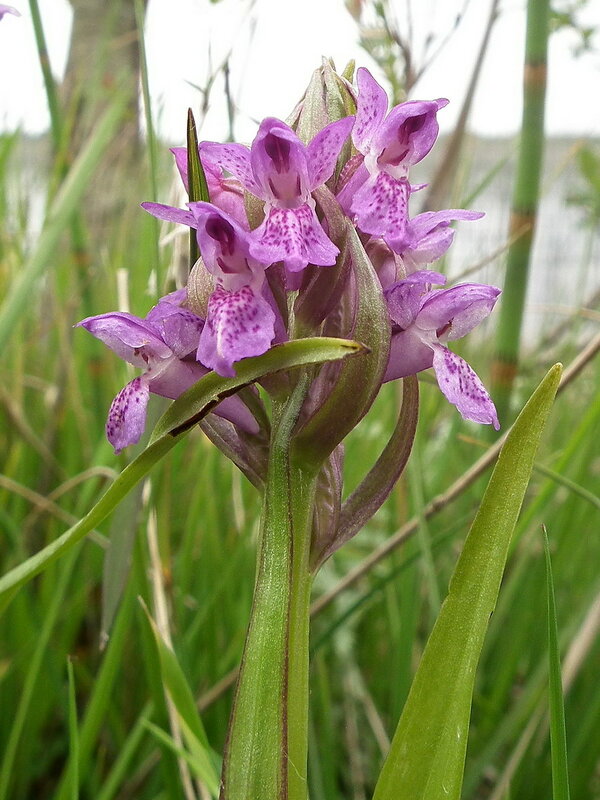 Bracts small and less curved than other early Marsh Orchids. Another species that has undergone many changes of name. 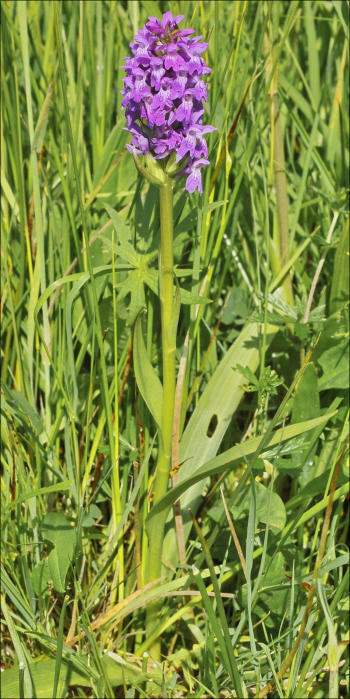 Known commonly as Pugsley’s Orchid and also referred to as Narrow-leaved Marsh Orchid. 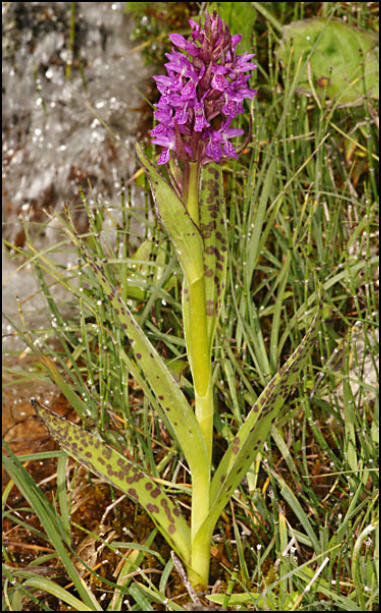 That is one of its clear field characteristics and several of the pictures shown below are from a small wet area at the Crossroads at Lough Bunny in The Burren where the plant enjoys very wet soil and is forced to grow tall and thin by surrounding rushes. 1. Can be quite tall and skinny, typically growing among other dense marshy flora. 2. Stems are yellowish green as they emerge but upper stem and bracts reddish purple. 3. 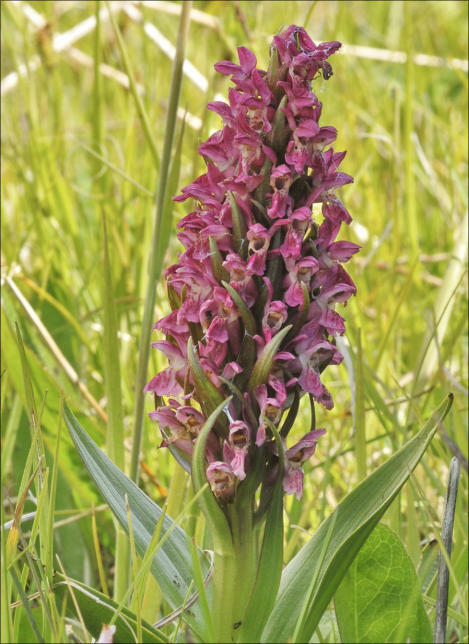 Bracts can be smaller and less curved than other early Marsh Orchids. 4. Several narrow long bright un-spotted leaves are straight and held close to the stem. 5. Flower head is loose and ‘see-thru’ with dainty pink-lilac flowers well separated. 6. Flowers are few in number and may predominantly face one direction. 7. 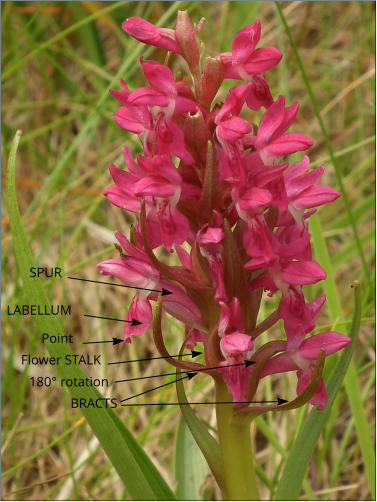 The labellum is lobed with the central lobe being pointed or longer than the other lobes. 8. 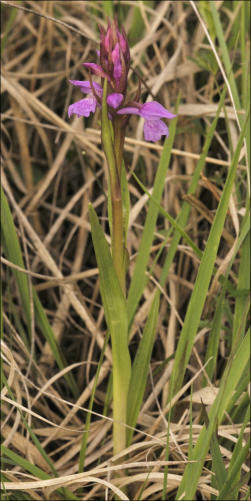 The thin spur, as long as labellum, is easily seen curving gently to a rounded point. 9. Flowers can be very delicate with sepals held high like a Hummingbird at a flower. 10. Lilac to dark rose/red flowers with white upper labellum. 11. Clearly shaped labellum with 3 similar promontories facing down and left and right. There is quite a bit of variability among the images shown here and not all the features listed above are evident but the habitat and general characteristics match this species. We would, as always, appreciate your comments. 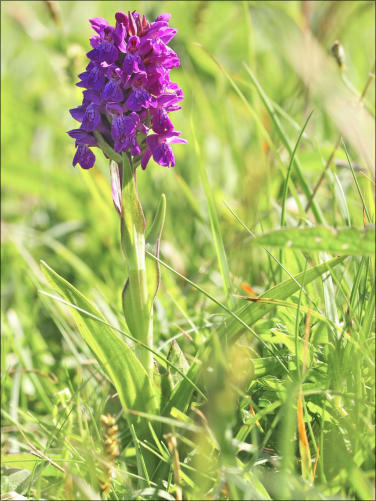 This is the Northern Marsh Orchid abundant and a joy to meet especially in western areas such as The Burren. 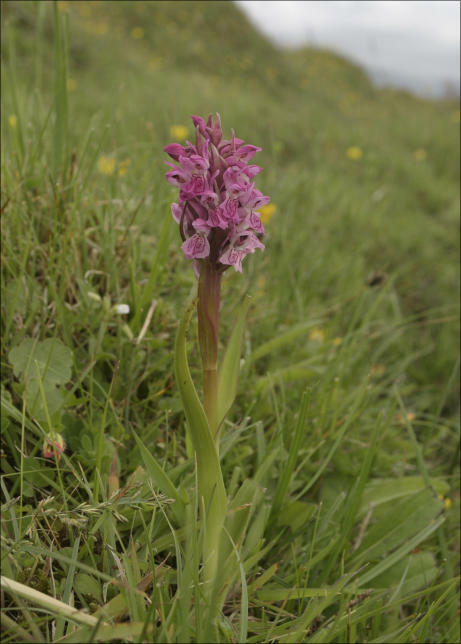 A late flowering species often found on wet overgrown sand bars but also on higher ground on limestone. 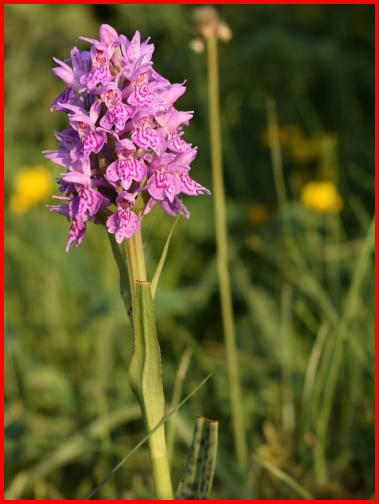 It is a striking erect plant which emerges from ‘lesser plants’ and stand as monarch of its patch. 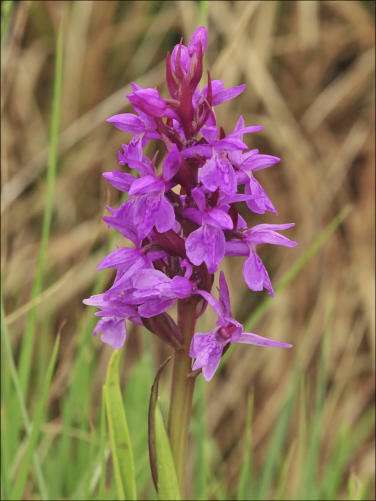 Its colour is also more consistent than other Marsh Orchids, perhaps darker than some of the images below (taken in sunlight) suggest. 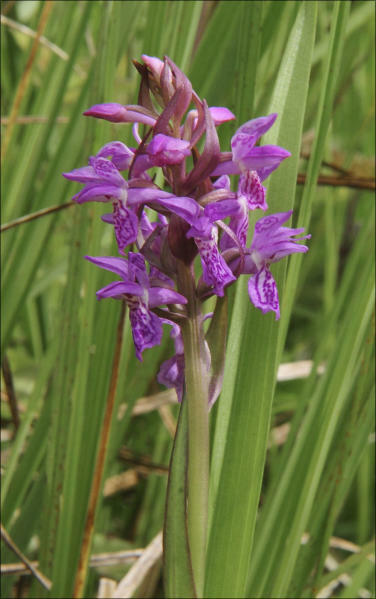 The incarnata Early Marsh Orchid displays a wide range of colours which are displayed in this group of 5 specimens taken over several years. 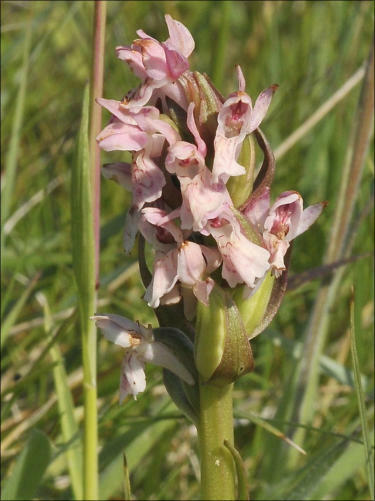 BUT they do have a distinctive flower structure consistent throughout the colour variations. All of these photographs were taken in early to mid June but from many different years. 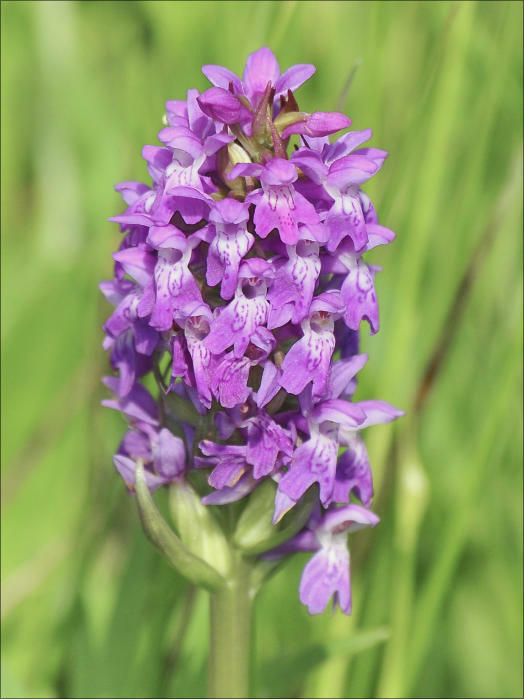 Seasonal weather will have an impact on flower development in different years but these range of plants are clearly similarly mature and the colour is innate to the individual orchid. 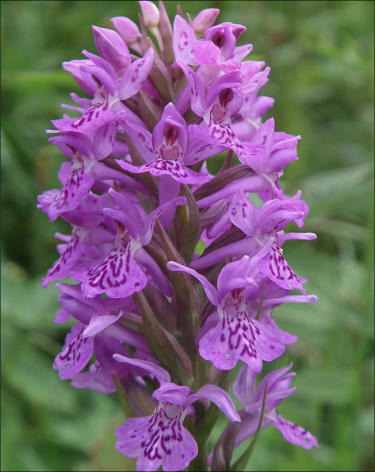 Of all species discussed on this page these plants show the widest range of colours, from white to purple, but consistent in height and shape. This collection of photographs represents four clusters of D. incarnata from four distinct regions, Bull Island Co Dublin, Mullagmore and L. Gara Co. Sligo and Drumharlow Co. Roscommon. (The latter population being very small.) The Bull Island population is probably the most isolated cluster — being surrounded by seawater — but it was a large community representing the full colour spectrum? The three specimens selected below are from different places and different times and they still look very similar. Isn’t genetics wonderful? This scarlet Orchid is one of the best. 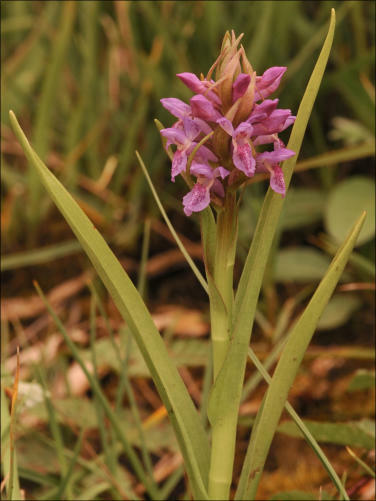 Very uniform in habitat, stance and colour — though it does have its moments. All the specimens shown here are from two very sandy habitats. 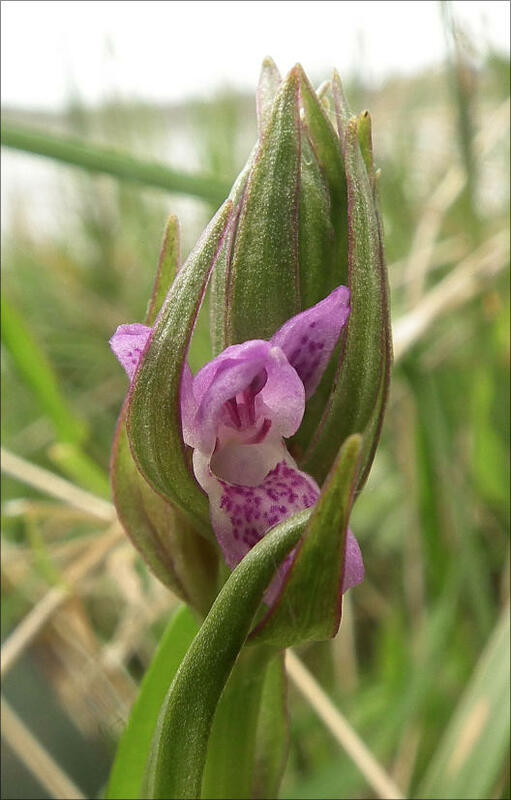 They love growing in a thin sward covering dunes or (more particularly) the flat sandy dry lagoons between dunes. It is a widespread species and often met where suitable dry ungrazed grass banks occur. 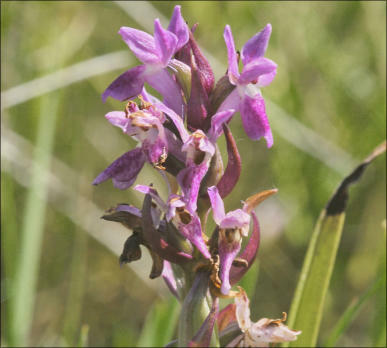 Its habitat and size and striking coloured flowers are enough to confirm identification. On RIGHT is a 14 year old photograph from different technology. It is a small image but the colour and lush grassy bank are attractive. . A surprisingly small and underdeveloped plant for the end of June. We wonder what the weather was like back in 2005. It is rewarding to come across old photographs which can still be used! 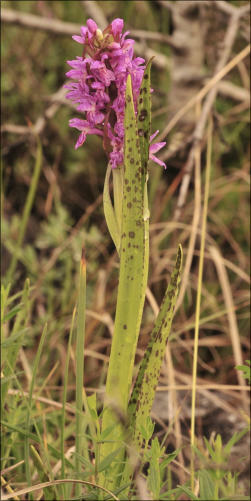 Dactylorhiza pulchella can be recognised fairly accurately from the following features. 1. 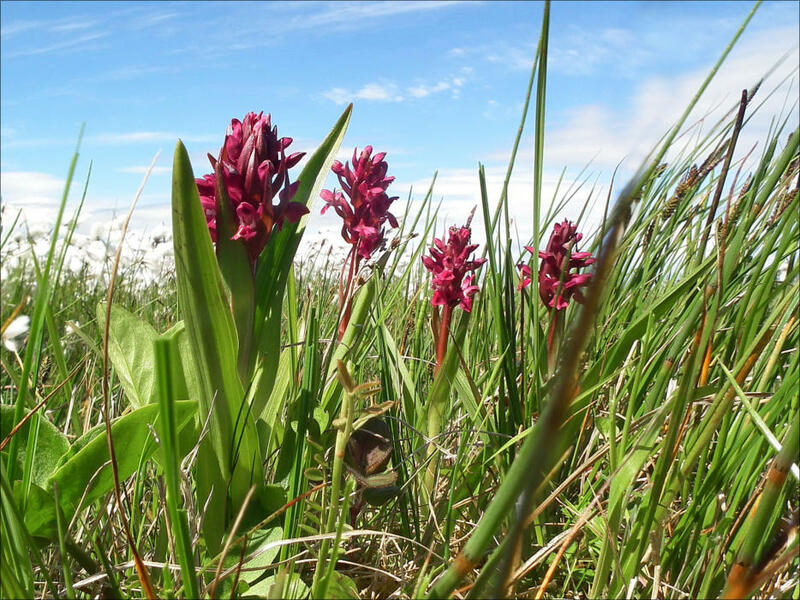 Occurs both in wet areas but also seems to favour dunes and sandy grasslands where it is smaller and stunted. 2. Very variable in growth. 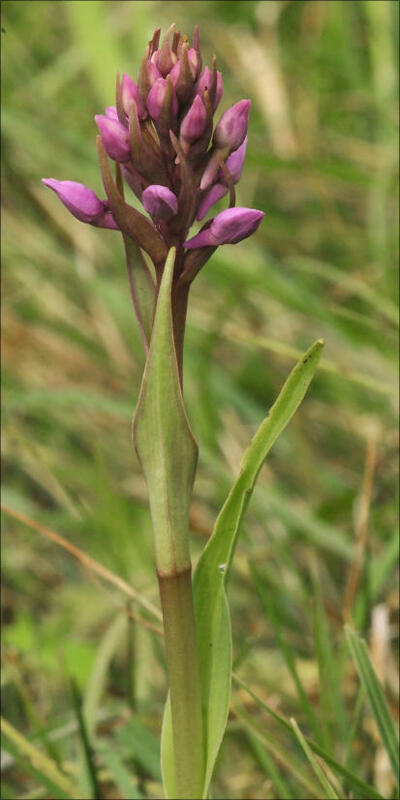 Can be very thin when surrounded by marsh vegetation. 3. Flower-head less dense with fewer (10 - 20) flowers. Flower anatomy and bracts clearly visible 4. Bracts sturdy and longer than flower, purplish and re-curving. 5. 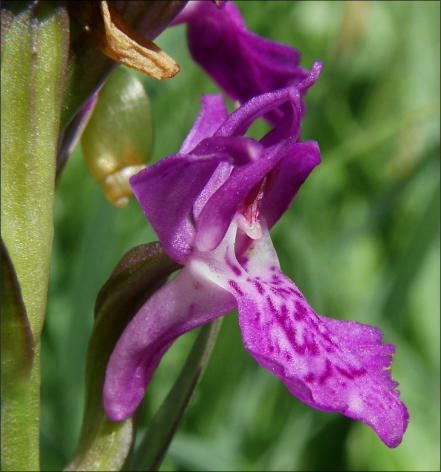 Flowers are often deep pink or purplish; labellum sometimes with clear shapes otherwise streaked and spotted. 6. 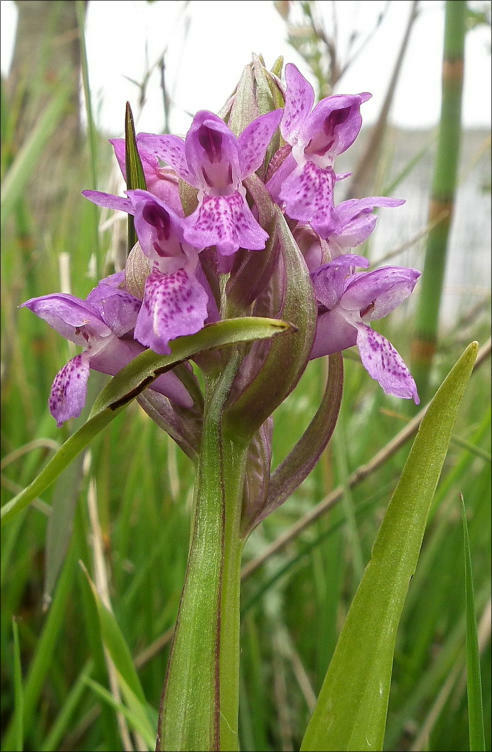 Labellum appears either diamond shaped or slightly lobed with centre lobe pointed or down curved 7. Lip keeled but less narrow than incarnata. 8. Spur longer than labellum, fat at base and tapering to a rounded point. Straight at first but can curve or kink towards tip. 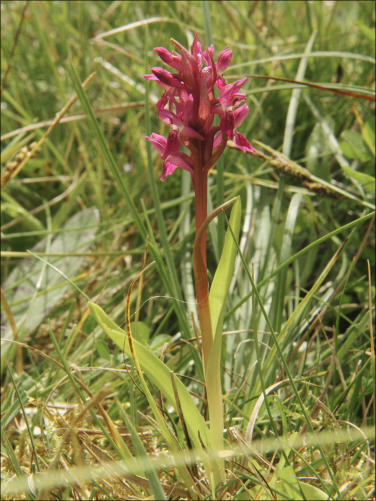 An almost identical plant… from the SWISS ALPS! This concludes our Winter 2019 project — catching up with a group of plants we have neglected. Like everything you do there is a great wealth of detail and satisfaction in becoming more familiar with a group of orchids we have walked past always planning to come back to them sometime. It has also been very satisfying to unearth so many photographs from many cameras going back many years and to find that the old ones are still good despite steady progress in camera quality. 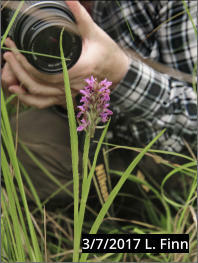 Botany and photography are such an inspiring partnership. 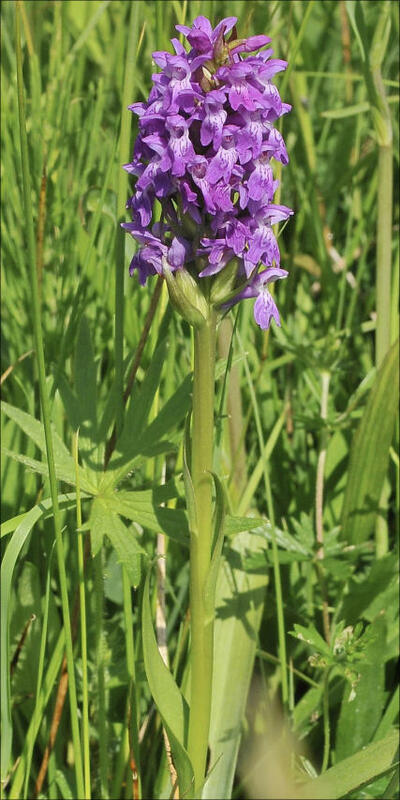 BUT, this is not to say we know the Marsh Orchids yet! But we know what to look out for better than we did last year. Some of it has been guess work, some of it has been help and advice but, as they say, all the mistakes are ours! 1. 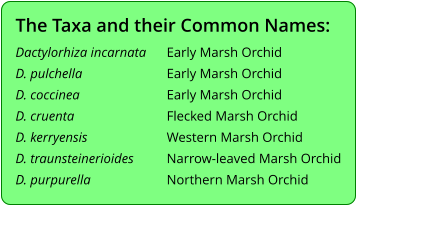 We admit to being impatient with certain taxonomy and overlong taxonomic names. 2. Binomial naming has a long and cherished history and was designed to bring clarity. 3. Not every plant fits neatly into boxes but certain ontological and ecological factors impact? 4. 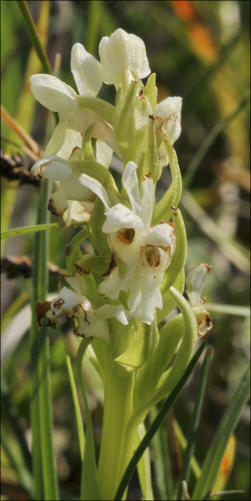 It is fair to describe an orchid as a ‘white pulchella’? All plants and animals have variation. 5. 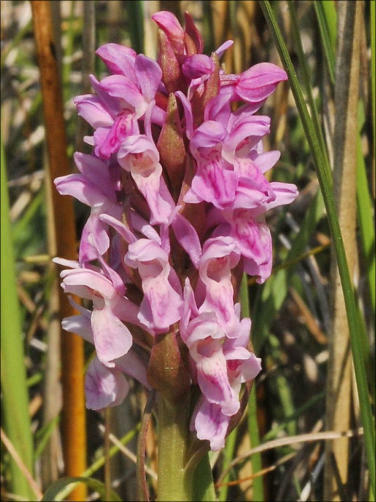 Morphology seems paramount as some Marsh species have a great range of colour. But, there are mistakes in all our work. 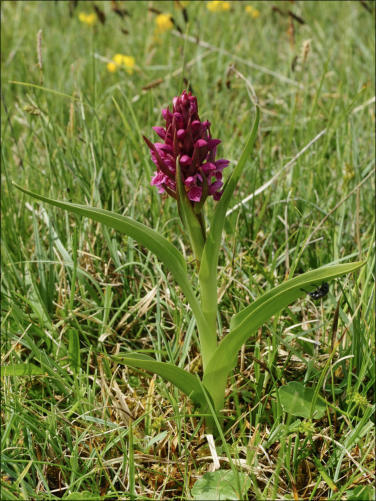 Hopefully this assemblage has some value even if it is only to make us relate dates, and habitats, and orchid outward appearance, in identifying a plant that may be a hybrid, or may be a variety/variant/sport. Some of these re-appear on form from year to year — vegetatively. But what happens to their seed? 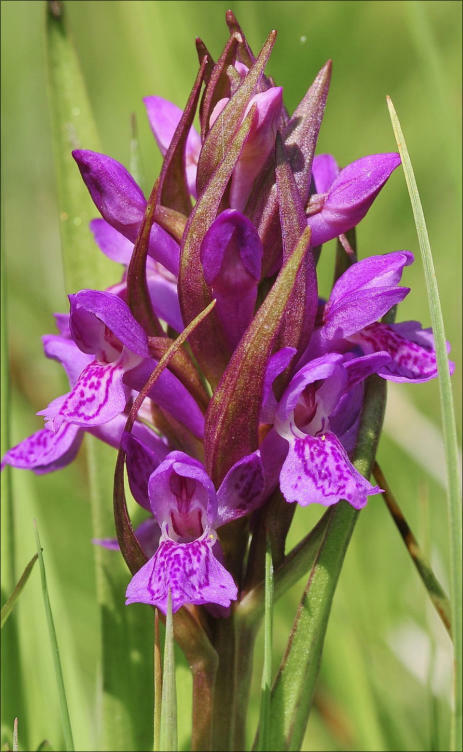 These Marsh Orchids are very variable and we have seen many shades of colour and features that fit multiple criteria. In all the 100’s of Spiranthes romanzoffiana we have seen — and we are fairly expert with this species — it has been 12 years before we saw an obvious genetic variation (notched stem with flowers along stem not just at tip!) And this is a very consistent Orchid not prone to variations — on this side of the Atlantic? 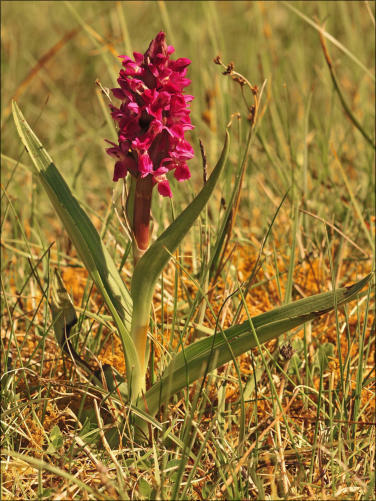 Perhaps this is because it is very much a loner whereas the Marsh Orchids have a whole range of Dactylorhiza to play with? Anatomical labels (ABOVE) are not shown in enlarged images! 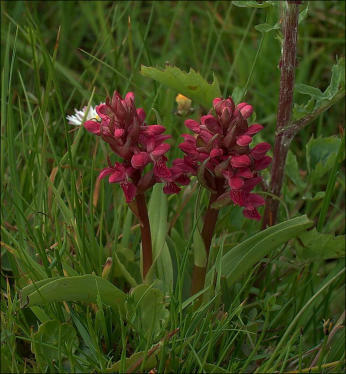 RIGHT: This Image is a good example of the FLAT TOP FLOWER of this species. Not always clear but characteristic when seen. This image puzzles us a bit. HELP needed, please! We leave it in this category but marked with a red border. It has many of the features of this group, e.g. labellum. But the colour range is like a Spotted Orchid with high wings!! !